Mackie has expanded their VLZ Pro line up to the big boards now, so even if you need 24 channels of professional-quality audio featuring Mackie's acclaimed XDR™ microphone preamps, you can have it all. And better yet, these new mic preamps give the new 24/4-VLZ Pro the best RFI protection of any mixer on the market. The 24/4-VLZ Pro is a 4-bus design with 20 mono mic/line channels and 2 stereo line channels. It features 6 individual aux sends per channel, 4 stereo aux returns, and inserts on all mono mic/line channels. A 3-band EQ with swept mid on all mic/line channels, as well as a 4-band fixed EQ on all stereo line channels will give you the control you need over your mix.This console is designed to make live sound mixing easier. You can solo a muted channel. Effects to Monitor lets you "fold" effects back into a stage monitor mix without affecting the main PA sound. There's a separate talkback section with its own mic preamp. Separate tape inputs with level control and routing to main mix make playing music during breaks easy. 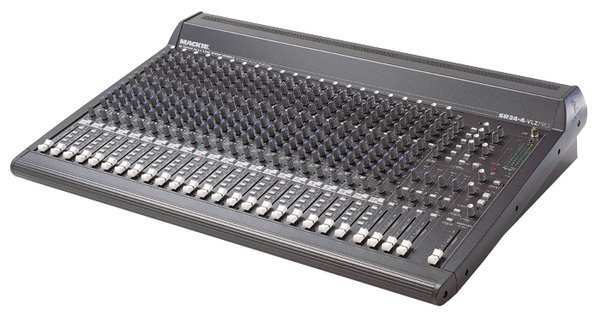 And typical Mackie touches like 18dB/oct Low Cut filters, Rude Solo Light and fast level setting via in-place stereo solo make this mixer an awesome value.